The research aspirations of University of Central Florida engineering student Heather Lawrence, who wants to discover ways to teach computers to analyze and fend off cyber attacks to reduce the burden on human defenders, will advance with some help from a scholarship awarded to only seven student veterans in the nation. The Student Veterans of America and Raytheon awarded $10,000 to veterans pursuing STEM degrees who demonstrate leadership in the community. Lawrence, 29, is a U.S. Navy veteran pursuing a doctoral degree in computer engineering. She also works as a threat intelligence analyst at Fortress Information Security. She is president of the UCF Collegiate Cyber Defense Club, the popular 280-member student organization also known as Hack@UCF. The club focuses on information sharing to improve skills and knowledge in the constantly changing field. Members often outreach to the community and talk to media to offer advice on how to keep personal data safe. The scholarship adds to her already-impressive resume that includes a national championship title. Lawrence served six years in the U.S. Navy as a nuclear engineering technician, including four years stationed on the aircraft carrier USS Carl Vinson (CVN-70). 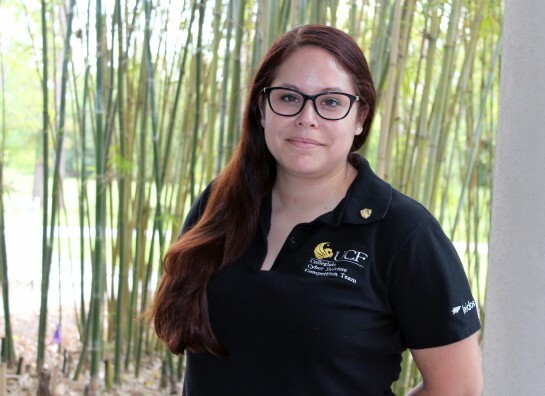 After returning to civilian life, she attended Valencia College then transferred to UCF where she earned a bachelor’s degree in computer engineering in 2015. She plans to earn a master’s degree in computer engineering this fall while working towards her doctoral degree. She competed on the 2016 national champion UCF Collegiate Cyber Defense Competition Team and was on the 2014 national champion team as an alternate. UCF has won three back-to-back titles in the National Collegiate Cyber Defense Competition, sponsored in part by Raytheon. Lawrence’s family moved to Orlando when she was young. She credits her mother’s lack of computer knowledge for her early knack with computers. With nearly two years of military training in nuclear engineering technology and then working on an aircraft carrier on dry dock and at sea, Lawrence said her Navy experience was an important stepping stone that prepared her for continued success in college. At UCF, Lawrence found camaraderie in Hack@UCF, where standing-room-only meetings in an auditorium involve discussing various aspects of cyber security and defense tactics. She said it was the supportive nature of club members that led her to the world of cyber security. Lawrence intends to stay in the field as a researcher and entrepreneur. Her UCF doctoral work will focus on ways to apply machine learning to prevent computer intrusions by looking for things that human analysts don’t see.